Born in 1970, Kate Sherman grew up on the Jurassic coast of Dorset. After graduating in 1993 with a degree in Fine Art, she continued her painting practice, while working at a fine art screen-printing studio. She continued to work in London for over ten years, curating and dealing in modern and contemporary British art, before deciding in 2005 to paint full time. She now lives and works in Sussex. Her paintings have a delicate impasto surface and brisk brush marks which belie their intricate structure – where compositions of skylines, horizon lines and road lines are sensitively balanced by fence posts, signposts or trees. 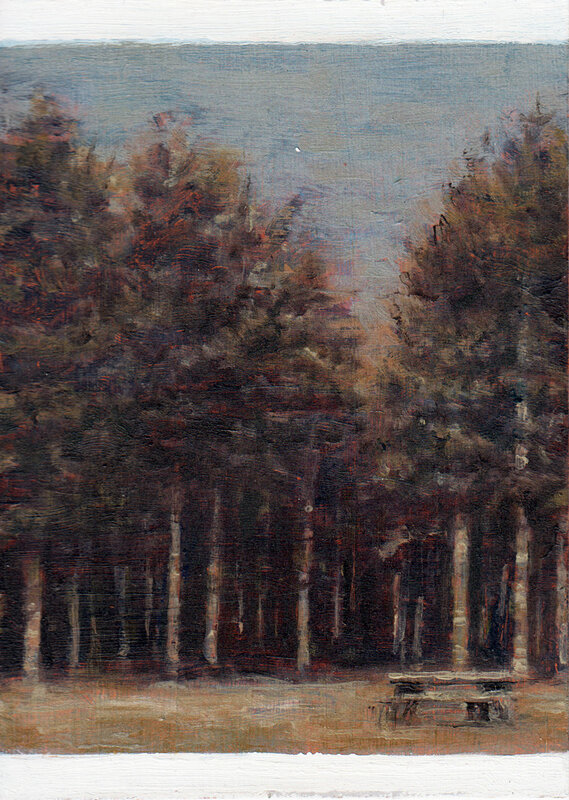 The paintings, all oil on board, originate from photographs she has taken of her surrounding landscape. This photographic source is important because the paintings capture a reflective notion of memory, of the emotional distance between a real landscape and a photograph, between experience and longing. It is a poignant and quiet melancholy reminiscent of Edward Hopper, that is expressed both by the portrayal of sparse unpopulated landscapes containing elemental traces of man, and by her restrained palette which is often suffused in a reserved northern European light of chalky blues and pink-blushed greys.